The Council of Ministers should submit to Parliament by October 1 information on the causes for growing prices and on the measures taken to curb inflation and to compensate socially disadvantaged people. 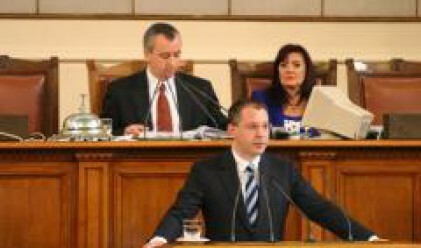 The MPs made a decision to this effect on a proposal by Coalition for Bulgaria Floor Leader Angel Naidenov and a group of MPs from the incumbent majority in connection with the debate in Parliament on the price hike. The decision was approved by 144 votes "in favour", 43 "against" and 5 abstentions. Parliament approves of the government's policy of maintaining fiscal stability. The MPs support the intentions of the cabinet that income growth should outstrip the growth in prices and the preparedness for action to support the people with the lowest incomes. A budget surplus of 3 per cent of GDP for 2008, a ceiling of budget expenses not higher than 40 per cent of GDP and a refusal to differentiate tax rates, particularly for VAT, are part of the government measures identified by Prime Minister Sergei Stanishev for offsetting the growth of prices during Friday's parliamentary discussion on the matter. Among the measures listed by the Prime Minister are enhancement of the powers of internal audit on the implementation of ministry budgets and a possibility for external auditing of the expenses of central and local governments; conducting a preliminary survey on the competitive environment by the Agency for Economic Analyses and Forecasts and the Commission for the Protection of Competition; designation of at-risk companies and market segments and sectors which will be checked by the National Revenue Agency, the General Inspectorate of Labour and the Commission for the Protection of Competition; implementation of measures to improve the market orientation of farmers; and control along the producer-distributor-trader chain for agricultural products concerning the distribution of profit. Another measure is the binding of monopolist price increase to the achievement of higher effectiveness and lower losses in providing services. Stanishev said that the reduction of VAT would be a typical pro-inflation measure. He said Bulgaria should honour its commitments to the EU in connection with the size of excise duties. He recalled that the prices of electricity and natural gas in Bulgaria are the lowest in the EU. Bulgaria is in an extremely favourable economic environment which differs substantially from other European countries, Stanishev said, as quoted by the Government Information Service. The Bulgarian economy is characterized by decreasing inflation and high economic growth, he said. Among the main reasons for inflation in the country, the Prime Minister underscored the external reasons, above all the price shock facing the world economy. Among the internal reasons for inflation, he listed the fact that Bulgaria has the lowest price level in the EU, the unfavourable weather conditions over the last few years which have caused a decline in agricultural production, the harmonization of excise duty rates for liquid fuels and cigarettes, and the higher standards imposed on the economy by the country's entry to the EU. High economic growth and investment flow also contribute to higher inflation, the Prime Minister said. The Union of Democratic Forces proposes that the entire budget surplus be added to the Silver Fund, which will lead to a decrease in prices, Martin Dimitrov MP said during the debate. The government does not have the capacity to offer adequate anti-inflation measures, said Lidia Shouleva MP of Bulgarian New Democracy. There was also another reason behind the pumping of inflation: to hinder Bulgaria's entry into the Eurozone and to move the country away from it until a vague future moment, as planned by circles of the oligarchy, Shouleva said. Aliosman Imamov of the Movement for Rights and Freedoms said there can be no talk of a price hike in Bulgaria because prices have increased gradually. According to Imamov, the question should be raised why the currency board arrangement no longer performs its principal function of maintaining price stability. He believes that low unemployment, which is already below the healthy minimum of 6 per cent, is also a factor for high inflation. The Simeon II National Movement proposes restricting unnecessary public expenses and continuing the reform and the optimization of the entire public sector, said Mariana Kostadinova MP. We should guard against the much too rapid increase of all incomes, because high income growth is one of the most serious pro-inflation factors, she said.